The add-ons Dobavi Roaming are only valid for postpaid plans for computers and tablets upon using mobile internet in zone European Union (EU). 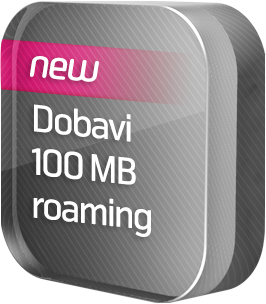 The activation of add-on Dobavi Roaming is possible only after depletion of the megabytes for Zone EU included in the initial contract or in an already activated add-on Dobavi Roaming. The purchase of such an add-on is available only in Bulgaria or a country in zone EU at http://turbo.lp.telenor.bg. The add-ons Dobavi Roaming are provided once and are valid from the activation date until the end of the initial term of the contract. The unused data traffic is not transferred for usage to the next billing period. After depletion of the included megabytes in add-on Dobavi Roaming, you can purchase another add-on for mobile internet, available on the portal for roaming services’ management: lp.telenor.bg. You can switch over to standard prices in roaming (roaming plan Travel’n’Talk) two months after the signing of the contract. The minimum initial charging is 5 KB and the interval for the subsequent charging is 1 KB.